The protocol we recommend dentists follow when removing mercury amalgam fillings is based on that of the International Academy of Oral Medicine and Toxicology (IAOMT). Even though some of its recommended procedures may vary from dentist to dentist we feel it’s important for you to be aware of this protocol because it was designed to minimize your exposure to mercury vapor and particles. 1. Keep the fillings cool during removal. Drilling out an amalgam filling generates a tremendous amount of heat, which causes a dramatic increase in the release of mercury, both as a vapor and in amalgam particles, during the entire removal process. Cooling the filling with water and air while drilling dramatically reduces the amount of mercury vapor the filling releases. 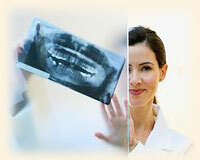 Most mercury free dentists use a removal process that’s commonly referred to as chunking. This involves less drilling, because the dentist only drills enough to cut the filling into chunks, which can then be easily removed by a hand instrument or suction. 2. Use a high-volume evacuator. Most mercury free dentists use a more powerful suction system than those used by most pro-amalgam dentists. We feel this is one of the most important tools in minimizing the patient’s exposure to mercury vapor and amalgam particles. The evacuator tip should always be kept to within 1⁄2 inch of the filling during the entire time the filling is being removed. This helps capture more of the mercury vapor and particles. 3. Use additional air purification. Some mercury free dentists use an additional air filtering system that’s placed as close to the patient’s mouth as is practical. The more popular ones resemble an elephant’s trunk and have openings about 4 inches in diameter. This can be helpful, but we agree with those mercury free dentists who believe that the patient can be adequately protected without such a system. It’s a nice addition to the removal protocol, but more important for the dentist and assistant than the average patient. 4. Provide the patient with an alternative source of air. Not every mercury-free dentist agrees with us, but we believe it’s essential to provide dental patients with an alternative air source while their amalgam fillings are being removed. This isn’t necessary after the removal process is completed, when the tooth is being prepared for the new filling, and while the new filling is being placed. But during the actual amalgam filling removal, the patient should be provided with a protective mask through which to breathe either compressed air from a tank, air from a source outside the office, or oxygen from a tank. Always instruct the patient to breathe through the nose and avoid breathing through the mouth while the fillings are being removed. We think this is especially important for pregnant and nursing mothers, patients who have existing health issues related to mercury, allergies, or immune system problems. 5. Use a rubber dam. A rubber dam isolates the tooth or teeth being worked on. Some mercury free dentists don’t believe this is absolutely necessary, but it’s our opinion that it can reduce the amount of mercury vapor inhaled through the mouth. Even though mercury vapor can pass through the rubber dam, we believe that a rubber dam makes it easier to evacuate the filling material and prevent amalgam particles from being swallowed. As long as the patient breathes through the nose, little if any mercury vapor will pass through the rubber dam. Finally, it offers an isolated and dry field for placing the composite filling. It does take a little extra time to place and remove the rubber dam, and some patients don’t welcome this. But anyone who is concerned about minimizing mercury exposure should insist on its use. In any case, the patient should be instructed not to swallow while the fillings are being drilled. As in everything, there are exceptions. With some teeth, particularly 3rd molars, or so-called wisdom teeth, it may not be possible to place a rubber dam. As long as the dental team uses all the other protocols, this is acceptable. 6. Immediately dispose of filling particles. While a dentist working alone can safely remove mercury amalgam fillings, it is easier for everyone to have an assistant working with him throughout the removal procedure. This will ensure constant suction and a continuous flow of air and water. 7. Remove gloves and clean the patient’s mouth. Once the amalgam filling(s) have been safely removed and replaced, the dentist and the assistant should remove and dispose of their gloves and the rubber dam, and thoroughly rinse and vacuum the patient’s entire mouth for at least 15 seconds. The patient should make every effort not to swallow during this procedure. We also suggest that after the rinsing procedure, the patient use a small amount of water and gargle as far back into her throat as possible. The patient should not swallow this watery residue! Instead, he should spit it into a sink or cup. 8. Immediately clean up. After the fillings have been removed and replaced, the dentist or dental assistant should immediately remove and dispose of the patient’s protective covering and thoroughly clean her face and neck. 9. Keep room air as pure as possible. There are a number of effective ways to purify the air in the office. We’re not making specific recommendations. But most mercury free dental offices filter the office air, as they work in it all day and it’s to their benefit to do so. This is more important for the dentist and staff than for the patient. Although mercury free offices don’t place amalgam fillings, they certainly are required to remove them. Removing the fillings releases significant amounts of mercury vapor, and any mercury free dentist would want to take the necessary precautions to protect the entire staff from excessive exposure to mercury. 10. Use activated charcoal. There’s some evidence that activated charcoal taken 10-15 minutes before amalgam removal can bind smaller particles of swallowed mercury, allowing them to be harmlessly passed out of the intestine via the feces. We consider this to be optional, as very little elemental or inorganic mercury is absorbed through the intestine, but it can’t hurt.